J.T.M. Provisions Company of Harrison, Ohio, is recalling approximately 14,525 pounds of fully cooked not shelf stable pulled barbequed beef. The product may be contaminated with extraneous materials -- specifically pieces of rubber. 14-oz. 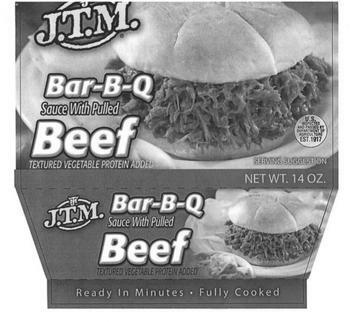 sealed plastic tray covered with a paper sleeve containing pulled (shredded) barbequed beef labeled “Bar-B-Q Sauce With Pulled Beef” with Julian pack date 17266 printed on the label. The recalled product, bearing establishment number “EST. 1917” inside the USDA mark of inspection, was shipped to retail locations in Indiana, Kentucky and Ohio. Consumers with questions about the recall may contact Joe Maas at (800) 626-2308.